“Simpson’s Donkey – a wartime journey to Gallipoli and beyond” by Peter Stanley tells the story of the World War One donkey through the donkey’s own voice. Certainly a novel way of re-telling one of Australia’s iconic tales for a younger generation. John Simpson Kirkpatrick was born in South Shields, England, on the 6th July 1892. He was the son of a seaman, Captain Robert Kirkpatrick, who for 20 years sailed on the London and Edinburgh run. An accident in 1904 kept Captain Kirkpatrick home until his death in 1909. Two days after the death of his father, Jack joined his first ship, the SS Heighington, and set sail from the Tyne. He had just turned seventeen. It was a year later, in February 1910, that he became a stoker on the SS Yedda, the ship that would bring him to Australia on the start of a journey that would end in Gallipoli. The Yedda was bound for Newcastle in NSW. Apparently Simpson was less than impressed with the conditions on board and jumped ship in Newcastle, dropping his last name, Kirkpatrick, to help conceal his identity. Jack had many and varied jobs over the next few years but the call to the sea was always in his blood. The First World War broke out in 1914, and he was one of the first to enlist, signing up in Perth, on 25th August 1914. He became Private 202 in C section of the 3rd Field Ambulance, and was chosen as a stretcherbearer, probably because of his stocky build and the strength he had developed after years of working as a stoker and fireman on board ship. He undertook training at Blackboy Hill Camp, near Perth, and held high hopes of returning to the Old Country to see his mother and his sister, Annie, before going to fight the war in Europe. It was a great disappointment to him when the ships left Australia, bound not for England, but for a training camp in Egypt. After this he was sent to the island of Lemnos in the Aegean Sea where the ships anchored in Mudros Bay. This was the place for further training for the assault on what was to become known as Anzac Cove. It seems very likely that the donkey that became his constant companion was also on Lemnos; expecting that they would need assistance to carry their guns to Constantinople, they paid two pounds and fifteen shillings for their long-eared transports. At Anzac Cove they dropped them overboard and saw them swim ashore, and forgot about them until they saw them in partnership with Simpson. On 25th April 1915 at 11.30am, Simpson stepped into the rowboats to head for the shores of Gallipoli. All of Simpson’s C bearer section was in the same boat. The firing had already begun as they rowed towards the beach in the darkness. The flash of gunfire would have been clearly visible on the shore as the Turks, in the hills and on the beach, shot down the men as they were landing, some at point blank range. Simpson lived through the landing but like thousands of others he did not have long to survive. That first day was spent with the other bearers of his company carrying the wounded on stretchers. But on the second day, Simpson was reported missing from his unit. What happened next was surprising. Simpson had come across a stray donkey wandering around in a gully, quietly cropping the grass. 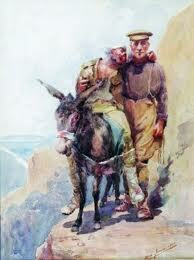 After helping to carry a heavy wounded man down to the beach, he hit on the idea of using the donkey as a transport. The task would be easier, as it would take only himself and the donkey, rather than a team of men, to carry each wounded man, and it also meant that he could make more trips up and down the hill. From then on Simpson and his donkey became a team and were allowed to work separately from the unit. It was the start of the legend. All the diggers knew Simpson and his donkey. They camped with the 6th Indian Mountain Battery Mule Camp but spent most of their time on the trail up and down Shrapnel Gully from the front line to the beach and back again. Estimates of the number of men that he and his donkey helped vary from seventy to several hundred. The gullies leading down to the beach were often considered more dangerous than the front line. They were open to sniper fire and shelling, and for the stretcher bearers there was no chance of taking cover or of running with their loads to escape being hit. Each man simply had to take his chance and trust that the bullet with his name on it was not yet on the way. The diggers kept asking: “Has the bloke with the donkey stopped one yet?”. It seemed incredible that anyone could make that trip up and down the gully without being hit. He seemed to have a charmed life. But Simpson’s time was already running out. When the firing down the valley was at its worst and orders were posted that the ambulance men were not to go out, the man and his donkey continued placidly at their work. Patiently the little donkey would wait while Simpson would crawl through the thick scrub to each wounded man. Simpson would then place him on its back and return to the beaches, the donkey trotting unruffled by his side. On another occasion, Simpson was said to have difficulty with his donkey, and warned the padre standing nearby to move away a bit because he had to speak to the donkey in Hindustani and he didn’t want the padre to think that he was swearing at the animal. On the night of 18th-19th May the Turks launched a violent attack on the Anzac troops in a determined effort to push them from the hills back to the beaches. All that morning the battle raged as the Anzacs held grimly to their lines. Despite the fire Simpson and his donkey kept up their work, but it was on that morning towards the end of the attack that Simpson made his last trip down Shrapnel Gully. His luck, inevitably, had run out. There are various accounts of how Simpson died, but according to his mate, Andy Davidson, he was shot through the heart by a machine gun bullet as he was making his way down the gully. Davidson and others were working at the top of the gully. After Simpson fell beside his donkey, they went back and covered his body and moved it to a dugout beside the gully while they carried on with their work. They came back for him that evening and he was buried at Hell Spit the same night. A simple wooden cross with the name ‘John Simpson’ marked his grave. And what became of Simpson’s donkey? There are various versions, but it appears that he remained in the care of the Indian Field Ambulance until he was finally evacuated to Mudros, where he disappeared from view.